TAIPEI, TAIWAN, APRIL 1978. 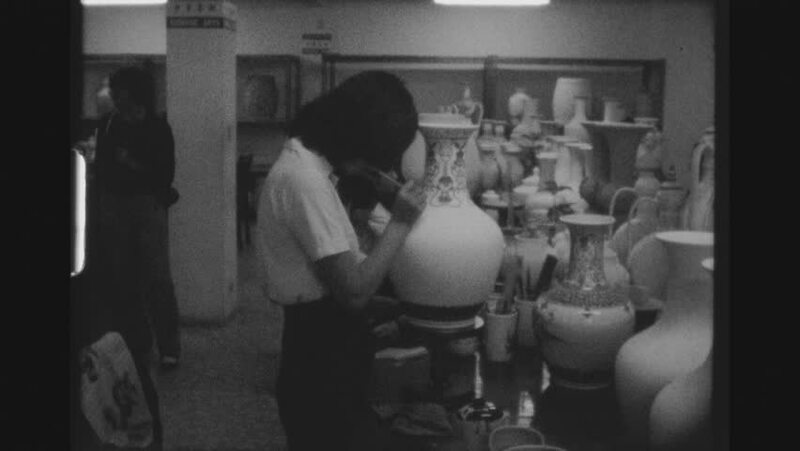 Group Of Female Employees Painting Concentrated Ornamental Patterns Onto Chinese Vases In A Pottery Workshop In The Yingge District. hd01:02CIRCA 1950s - A teenaged boy and girl greet their friend and allow an older woman to get on the bus first in the 1950s. hd00:29New York, United State of America. About 1933. Albert Einstein arrives in New York. hd00:231950s: man in jumpsuit sits on basement floor, stands up, talks to boy girl and woman, put gloves in pockets, gather blankets and hammer. hd00:261950s: School. Young man approaches group. Teenage boys walk away. Young man shakes head. Group of students walk down street. Group ignores people waving. hd00:58CIRCA 1953 - MPs and members of the Shore Patrol check travel orders on trains and keep watch over military ports and docks in America.